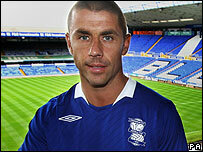 Kevin Phillips has signed a two-year contract with Birmingham City, turning down a further season at West Brom. The 34-year-old was named in the PFA Championship Team of the Year as his goals helped Tony Mowbray's side to promotion back to the Premier League. In all he scored 46 times in 81 appearances for the Hawthorns club, and was holding out for a two-year deal. He becomes Blues' second experienced addition of the summer, following Everton midfielder Lee Carsley. Phillips has bagged more than 200 league goals in a career encompassing spells at Southampton, Sunderland, Watford and Aston Villa. Last season he scored 24 times in only 38 appearances. Phillips' decision has come as a disappointment to Barnsley, who revealed they had made contact with the former England international and his agent when it became known he was available. Reds boss Simon Davey told the club website that the striker's rejection was a blow. "I am disappointed for the fans because Kevin would have been an amazing signing," said Davey. "It shows how far we've come as a club; he is the calibre of player we want."